The New York, Ontario & Western Railway has been popularized as having been heavily dependent upon three major sources of revenue for most of its life: coal, city vacationers bound for resorts in Orange, Sullivan, and Delaware Counties in New York, and milk. Bux and Crist’s Scranton Division and Wakefield’s To The Mountains by Rail addressed the first two. This effort addresses the third. Beginning with the diary farmer himself, the story spirals outward to encompass the railroad, its special cars, the route and the communities that developed. it is the story of a commodity that created away of life, was made available by and contribute to the continuance of a transportation system and eventually abandoned that system when another became more practical. 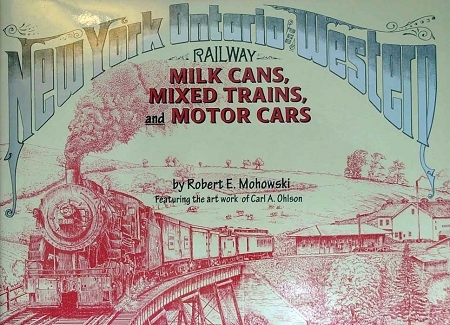 Although much of this story is concerned with the New York, Ontario & Western Railway, there is information that applies to milk hauling railroads in general …Local and regional historians, students of agriculture and technological history, rail enthusiasts and those who enjoy a fond look back to simpler times will enjoy their first reading as well as subsequent references to its texts and illustrations.